At IFA 2014 Expo in Berlin Samsung has unveiled a fleet of office printers powered by none other than Google’s Android operating system. It is Designed to be setup and used without a PC. There are 10 new smart MultiXpress models each have feature a 10.1-inch touchscreen huge panel that can be used to search ABD print from web-browsers, Emails , Maps , images and other various type of contents. The Printer has also a feature of NFC-enabled , in addition to be compatible with Samsung XOA printing platform and Samsung Cloud print. 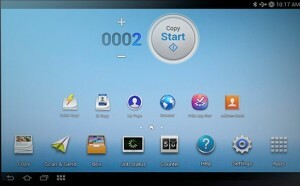 And also have a feature that is the meaning documents can be printed remotely through Smartphones and tablets as well. Samsung also states that the new Samsung Android printer will be helpful for Business users by providing faster documents processing speeds, a very great thanks to housing processor that are up to 1.5 times faster than those used in the previous models. Samsung Android Printer also offer longer lasting toner and drum technologies , and the best part is which makes these printers more reliable while lowering the total cost of ownership. The X4300 series of A4 Colour MFPs. The K4350 series of A3 Monochrome MFPs. M5370 series of A4 Monochrome MFPs. The M4580 series of A4 Monochrome MFPs. But there is no word on pricing or availability, just yet to be Declared by Samsung.